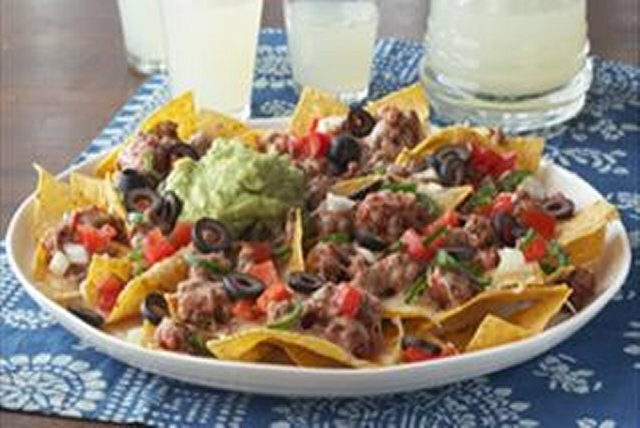 Exactly what you’re looking for in a nacho platter: crunchy tortilla chips, ground beef, salsa, melted cheese and a dollop of guacamole. The perfect game-day appetizer. Brown meat in large skillet; drain. Stir in salsa; simmer 2 min. Arrange chips on large microwaveable plate. Top with meat mixture; sprinkle with cheese. Microwave on HIGH 2 to 3 min. or until cheese is melted, rotating plate every minute. Top with remaining ingredients. Omit ground beef. Mix the salsa with 1 cup refried beans; spoon evenly over chips on large microwaveable plate. Sprinkle with cheese. Microwave as directed. Prepare as directed, substituting 1 cup chopped cooked chicken for the browned ground beef and increasing the salsa to 1 cup.